Another week, another Lush Bath Bomb. This is another gem from my recent Lush splurging trip I recently went on. When I buy Lush bath products, I never google the items I intend to buy beforehand to see what happens. I like the element of surprise as I drop the bath bomb under the hot water. What will happen? Will I get multicolours? Will I see glitter? Will it fizz? Oooh, the suspense! I was torn between this Dashing Santa Bath Bomb and the Father Christmas Bath Bomb but I decided to go for Dashing Santa as it smelt wonderful, plus I listened to the girl in the shop talk to me about it for 5 minutes and I felt it was only fair to buy one after she tried so hard to sell it to me. "Santa's golden boots fizz away first, sending him dashing around delivering lustrous waters of cheery mandarin oil. Bright, fruity bergamot and orange flower absolutes scent the air like fresh satsumas, making him a perfect treat for the bottom of stocking." I love the idea of this. It such a modern take on the traditional satsuma in the stocking gift. I actually think Lush should make a Christmas Bath Bomb that looks and smells just like a satsuma as I imagine it would be really popular and more people would understand the concept! 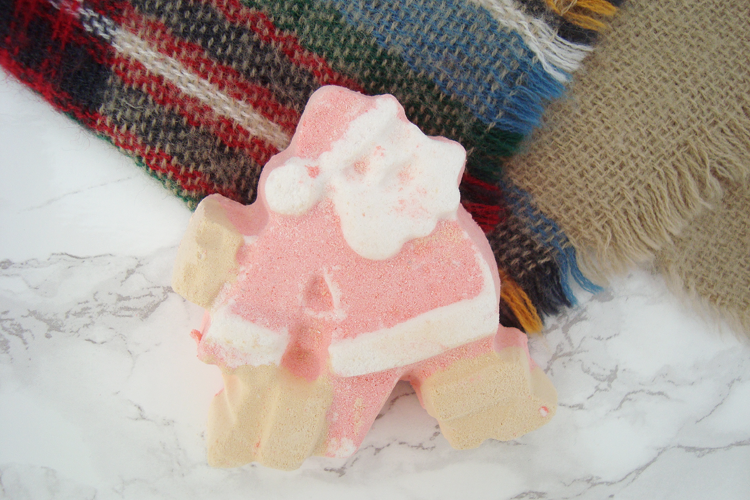 When popped under hot water, Dashing Santa dashes around the bath at a fast pace. The almost yellow part of Santa dissolve and fizz almost immediately, leaving him to run around the bath leaving an orange, red and gold sea in his wake. It foams up quite a lot and takes quite a while to dissolve. In fact, there was still 1/4 of it left in tact when I was ready for my relaxing soak. When everything has died down the bath water is left bright red but I didn't notice any glitter floating around. 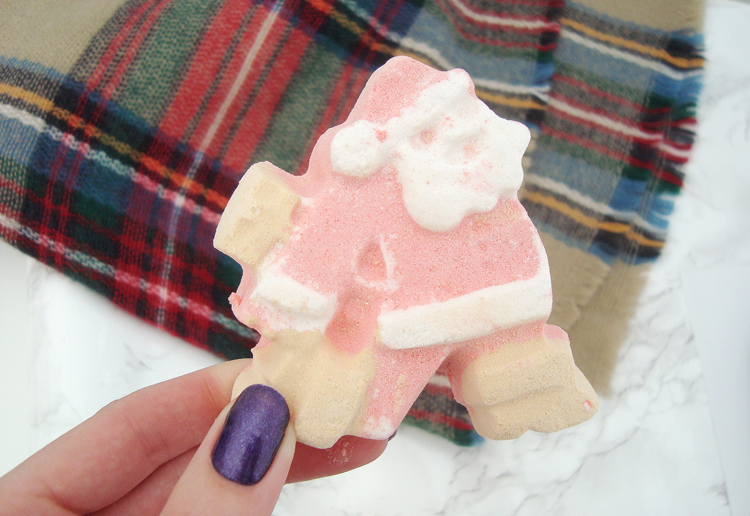 I absolutely adore the fruity scent Dashing Santa unleashes but when sat in the bath bomb water, a thought occurred to me. Excuse me for what I am about to say but it just looked like I was sat in a bath whilst enduring a rather horrendous period. Don't get me wrong, I still enjoyed it and I definitely enjoyed it more than if I were sat in a bath full of my own blood (sorry) but I do believe Lush have better bath bombs than this one. Hahah that last paragraph is hilarious - I do think that when you see pictures of baths that have these products in them, even when some turn murky blue-grey shades, I don't know that I would feel clean being in it!